As part of this project, we are developing a Chrono model of RoboSimian, an apelike robot developed and built at NASA’s Jet Propulsion Laboratory. 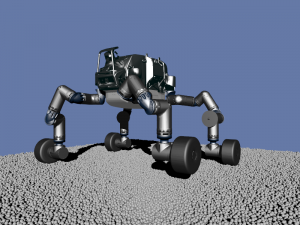 The goal of this project is to provide a simulation-based assessment of RoboSimian’s mobility characteristics over deformable soil and compare its performance in one of its four possible locomotion modes (driving, walking, inchworming, and sculling). The RoboSimian Chrono model is created from the URDF robot description and is actuated with positional motors at each of its 32 joints. The robot simulation environment permits actuation of the robot in any of the possible locomotion mode and collection of performance and mobility mettrics, such as motor torques, motion resistance, and drawbar pull. Feedback, questions or accessibility issues: negrut@wisc.edu.